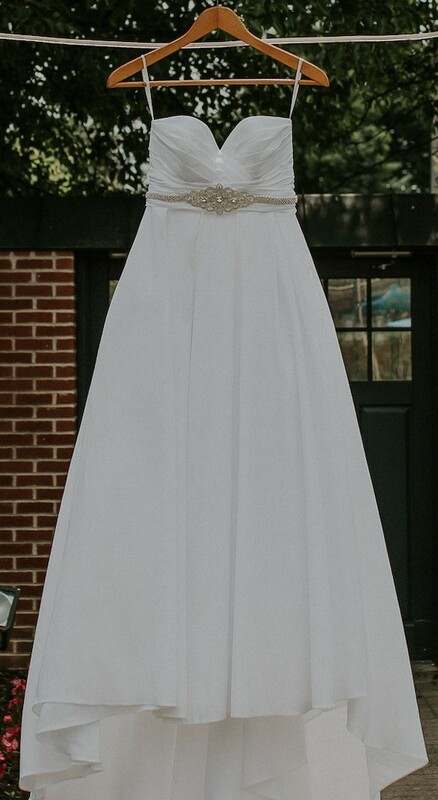 This is a beautiful stark white dress that has a belt that is removable. The belt was purchased for $150 and it comes with the dress. This dress has an A-Line waist with a sweetheart neckline. This dress also has a bustle with buttons that is not noticeable at all. You would think that the dress came like that. The dress has been cleaned. This dress has multiple layers. Will ship anywhere at the buyer's expense. This dress also comes with the A-Line Under Shape wear, to make it look like the photos you see above Low Back Bustier, and A-Line Silhouette Slip. A-Line Shape wear was retail $200 together.